Green Delight is a residential project developed by Green India Infra. The project offers very well designed residential 2BHK and 3BHK apartments. The project is well connected by various modes of transportation. The site is in close proximity to various civic utilities. What is the location of Green Delight?The location of the project is Sundarpada, Bhubaneswar. What are sizes of apartments in Green Delight? The apartment sizes in the project range from 840.0 sqft to 1478.0 sqft. What is size of 2 bhk in Green Delight? 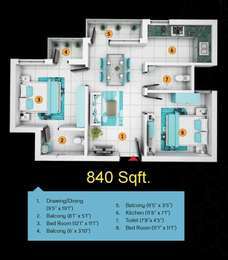 The area of 2 BHK apartments is 840.0 sqft. What is size of 3 bhk in Green Delight? The area of 3 BHK apartments is 1478.0 sqft. How much is the actual area of Green Delight?The area of the project is 16.0 Acres. How many units are there in Green Delight?There are 1500 units available in the project.